After enjoying my walk along the busy Gaya Street, I decided to head over to the Central Market to find that elusive tarap fruit. If you have read my post on the tarap fruit, you would have already knew my story. Along the way, I passed by this orange colour building on Jalan Pantai. It's The Town Inn, a budget hotel for shoe string travelers. The building stood out because of its colour. Its location is pretty good as it's very near to the famous Gaya Street. Walking towards the Waterfront, I passed by Hyatt Regency Kinabalu, where our Prime Minister Dato' Seri Najib Razak stayed last week during his trip to KK for a walkabout to meet the traders at the Waterfront markets. From the hotel, I could see the ikan todak (sword fish) in the middle of a roundabout ahead. 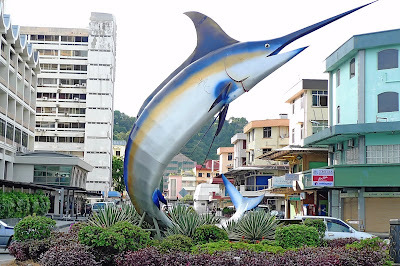 This sword fish is a famous landmark in KK. It is located along Jalan Tun Fuad Stephens near the Segama Waterfront. But, wait! There's a policeman there! What was the policeman doing there? Only then I realised there was some kind of procession going on along the main road. The policeman was there to divert the traffic. What instruments were that? 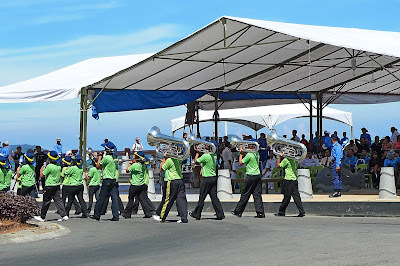 I think they were tubas. I only took photos from the back as I was just too lazy to walk up to the front in the hot sun to take pictures. There were many policemen in uniforms around. I wondered what occasion was that all about. 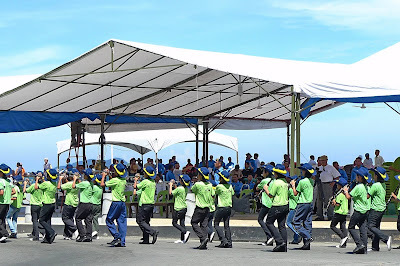 Only much later, when I came back from my KK trip, did I googled about the event and found out that it was a rehearsal for an upcoming "Freedom Of Entry To City" event organised by the Kota Kinabalu City Hall (DBKK) and the Royal Malaysian Navy (RMN) on April 18th. Anyway, I was not very satisfied with the pictures I took of the sword fish. So I went back the next day and took this photo. The fish looks very much better at this angle, no? What happened next was a visit to the Central Market to search for the tarap fruit which you would have already read. If not, you are welcome to read it here. After I left Central Market, I was so thirsty I decided to get myself a drink somewhere. Passing by this coconut stall, I decided to drink coconut water! 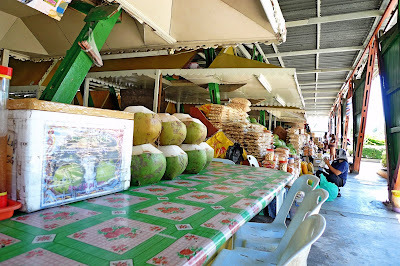 This stall was located at the fruit market near the Filipino handicraft market. This is my coconut drink. It was quite huge and at only RM2.50, I thought that it was pretty cheap! They also provided a spoon for me to scrape at those flesh inside the coconut, but I did not bother to do so. I just wanted to relief my thirst, and boy, was I relieved! It was close to noon time by then. After all those walking the whole morning, I was hungry. I decided to stop by this Hong Kong char chan teng (restaurant) for lunch before going for my proboscis monkey tour at 1pm. 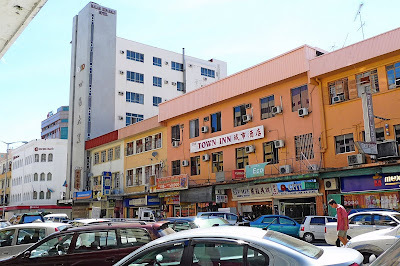 The Sin Wang Hong Kong Restaurant is located at the ground floor of Warisan Square. 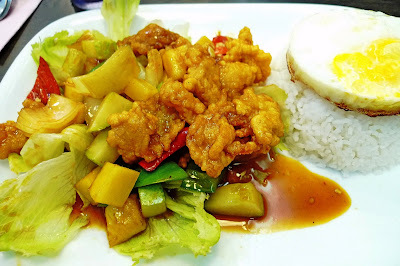 I ordered the sweet and sour fish meal with rice and omelette. And a glass of ice cold Chinese tea. I thought the food was pretty good! At RM11.90, it was reasonably priced. After this satisfying lunch, I returned to my lodge and rested for a while before I got ready for my next trip to see the proboscis monkeys. Was my holiday fun? You bet! the coconut is so cheap eh ;-) oh u went to Manukan Island!!! I wonder can bid for tarap fruit on lelong or ebay? lol. Wow really cheap coconut! Was it sweet? RM11:90 :o Ok that is quite expensive imo. But it looks like there was ALOT of fish in it! ladyviral, yes coconut really cheap! Cannot find this price in KL! 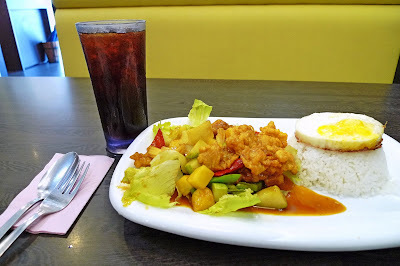 The dish RM11.90 is comparable to similar dish in KL except that in KL, the portion will be smaller. Err.. not sure why the swordfish is used as the landmark there. Too lazy to find out... Haha! Would love to fish one of these sword fish one day! That sword fish is a remarkable landmark! Good thing you took some more pictures with a better view. Your meal looks yumyum, now I'm thinking of cooking that! Oh yes, later for dinner! What you went there again to snap the swordfish photo? Wow! You are full of zest huh? very pro wor. War...coconut so big just RM2.50? You should buy a few and bring one back for me mah! You holiday fun? I bet? RM50? Haha :D From your blog, you surely had a ball of time huh! 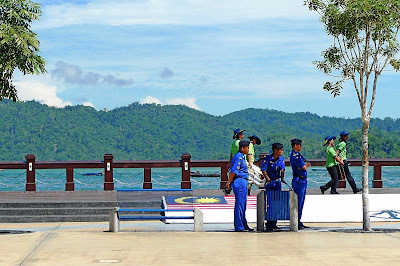 Sabah looks like a pleasant place to visit. lol. Well, near my office there is this guy who sells coconut for RM2.50 too. A Whole coconut! Yes, KL food expensive and less >_<. 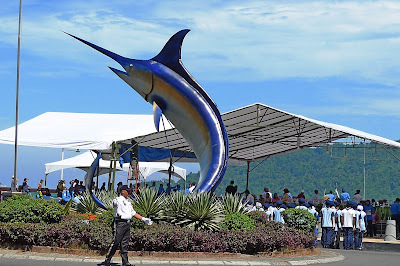 Why is the Todak fish put at the roundabout? I want to know the story!!! I echo Lina's comment..hehhe. And what's the story with the Todak fish? Over in Sandakan they have animal statues in roundabouts too. It must be an 'in' thing in East Msia. What a leisure morning you had there. Nice to walk around the town. Eat and drink whenever you wanted to. Never know of the swordfish. Regarding the swordfish pictures, I think it looks better if the background is the sea rather than shops. Ohmygod now I miss KK even more. Can't wait for your Manukan trip. Wonder whether you island hop or just Manukan. You must have planned for this trip quite carefully. I think all the swordfish pics were ok, it depends on what subjects you want in the pic. The animal statues in Sandakan are sponsored by local tour operators coz lack of funds from the local council. wow... the swordfish kan.. if a bird accidentally flew its way there, sure die one! dangerous! LOL! 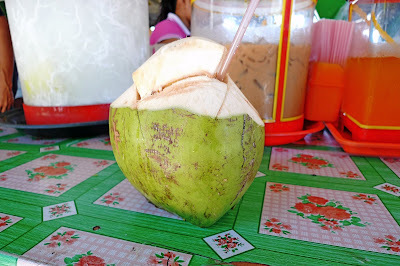 The coconut pic made me drool coz it's super hot & bright right now that a coconut would be yummy to quench my thirst. lol! The place is very impressive as can be seen in those striking photos. The food looks great too! Yummy! I really wish to be there someday! wow nice orange building!! haha..
marching band? yeap, the back line consists of tuba players.. haha..
You took it really well, Foong! ayie, I normally eat the coconut flesh too but not that time. Just wanted to cure my thirst! tekkaus, actually I'm not so full of zest lah. 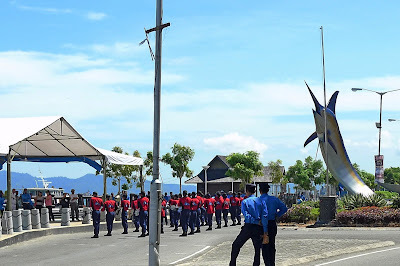 Just that the next day on my way to take the boat to Manukan Island, I passed by this swordfish again. Haha! Bring back coconuts to KL then travel to Melaka to give to you? Too much work, lah! haha! Besides, I'm sure you also have coconuts in Melaka selling at this price, no? From what I know, food in Melaka is quite cheap compared to KL. ladyviral, really? Where in KL? Is the coconut as big as the one I had in KK? All the photos of the swordfish is OK? Well, actually the subject I want in the photo is the swordfish! LOL! mei teng, did you by any chance, took photos of those animal statues in Sandakan? Foong, I didn't photograph those statues as I was in the moving vehicle passing through the roundabouts. They have a croc and orangutan and something else which I have forgotten..in Sandakan town. I am now so tempted to taste and try that mysterious tarap fruit... but can't get anywhere else other than KK, how la...??? Help help, I want TARAP FRUIT! RM1.90 for that plate of rice! That's economical. I also want to try tarap fruit. RM2.50 for a coconut is cheap. Over here, it's no less than RM3.50 now. I love fresh coconut and the flesh that comes with it. Yum! Foong, noticed the additional stories widget you have at the end of each post. Great for driving traffic as well as giving new readers a chance to read your archives. But noticed that the earlier posts do not carry this feature. Is it not auto across the blog? Yep! Better picture of the swordfish. Effort not wasted. LOL! irenelim, haha! I think you can find tarap fruit in a lot of places in Sabah, not just in KK. But my friend told me it's harder and harder to find tarap fruits because they are being replaced with palm oil trees which yield better profits. eastcoastlife, you read wrongly. It's RM11.90, not RM1.90! Wow, if only it's RM1.90! I would eat double. Haha! bluedreamer27, you've eaten swordfish before? Gosh, I haven't! How does it taste like? Ooh, I love the sweet and sour fish dish - absolutely yummy! tekkaus, haha! I don't think there'll ever be an LC (Last Commenter) cos all the earlier commenters would try to comment again so that they appear to be the last commenter. LOL! happysurfer, I like to eat the flesh whenever I drink the coconuts too, but not on that day. Regarding the additional stories link at the end of the post, yes they appear on every post, even the older posts. You just got to wait for a while for them to appear.